Aluminium roller rocker arm set features full needle bearing on fulcrum and roller tip for increased horsepower and reduced friction. Will also reduce wear on valve tip. Set contains 16 extruded aluminium roller rockers and locks. 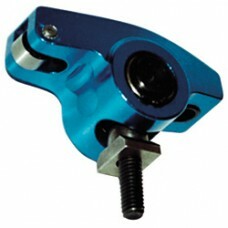 Fits Ford Small Block with pedestal mount 1977-1994 302HO & 351W with hydraulic & roller cams. Requires tall valve covers for clearance.